Brought in our CR-V for an overfilled crankcase. The oil had a strong smell of gasoline. The dealer did a product campaign #1245A2. Two plus months later I noticed my oil is now over filled again. Also getting a strong gas smell when I turn on the defroster. I had called Honda company direct and the told me they would have a Rep call me. Never did. Also I had asked the dealer to write on the service ticket about the gas in the oil as I'm worried about future engine problems. The dealer refused to do it. Seems like Honda is trying to cover this up in the event of a future recall or litigation. If I didn't buy the extended warranty I would get rid of this car in a hurry. I have also had other problems with it and with the dealer. I had the recall (Software Update & A/C Control unit replaced) done on my CR V back in January 2019. I never had the gas smell, but the Engine Temp does seem to rise quicker now after the recall work was completed.I drive 17 miles one way to work and Highway miles, so the engine has ample time to "burn off" (eye roll) the gas in the cylinders. When I picked it up, the oil was exactly between the full and add marks on the orange read tip. I just checked it after putting 2,777 miles on it since the recall, Its above the Orange Tip by about a quarter of an inch. I contacted Honda, was assigned a Ticket number was told to call back with the ticket number. I have have called 3 times left message and my ticket number to "Geneva". One week has past (3/23/19) no one has returned my call. My first Honda, and may be my last, they (HONDA) simply are ignoring this issue. But why should I be surprised, When I first bought the CR V in 2017 (first one sold at my local Honda Dealer) I called Honda and asked about an issue I had with the Hankook Tires, The representative that day argued that ALL CR-V on the new re-designed CR-V come with Bridgestones! I guess I should have know then that HONDA is NOT the company they were at one time. When checking the oil level on the dip stick, it was about a half inch higher above the full level and smelled like gasoline. Apparently Honda is aware of the problem but does not know how to fix it, no help for the owners. NOT HAPPY!!! After finding out about the gas in oil problem for CRVs, checked our 2017 and sure enough, excess fluid on dipstick, very black, smelly. Upon draining, smells far worse than any of 100s of oil changes I’ve done ove 50 years. Sent sample in to Blackstone Labs, gas over 4% of volume, way over average values, lowered viscosity, and higher flammability - at lower temperatures. Have complained via email to owner of selling dealership, Moss Honda in Moreno Valley Ca, no reply. Plan on continuing to pay for oil tests at labs to validate and substantiate my issue. Have read people being told to watch levels, change oil? Great ideas? Just keep changing the oil? Even for free it would be a pain. Supposedly being fixed in newer models, but this is my, 2017 1.5l turbo. Very concerned about resale, reliability, breakdowns, and mechanical damage due to reduced viscosity and flammability. Also there’s claims it’s a cold weather, infrequent use, low mileage trip problem. I live in hot Southern California, we drive frequently and many miles (24,000 in less than 2 years) and never take short trips, so it’s happening in hot climates too. Checked oil at 1600 miles and it was way over full mark smelled like gas. Called dealer and they said there was an open recall on the vehicle and bring they would not admit it was for this problem. They did update and changed oil but not filter. Gas mileage has dropped since software update. I will be keeping a close eye on oil level now. I am the 2nd owner of a 2017 CRV Touring class which only had 27k miles. After owning it for only a few months I receive a product update letter from Honda regarding a needed software update and A/C control unit replaced. I wasn't experiencing any of the noticeable signs that other owners cited regarding gas smell or heater problems. However, I did have the shift button on the handle come off (cheap part!). As I was enroute to the dealership to have my product update performed my car suddenly lost power from 65 mph on a busy highway dropping down to 25 mph with semi-trailers riding up on my bumper! A very frightening experience! I managed to eventually pull over and wait for roadside assistance. I had to be towed the rest of the way to the dealership! Fun time! The dealer performed the update and I was feeling good about the fix until I started monitoring my oil levels and found the problem had persisted. Oil levels continue to be high! So the update didn't fix the problem! I am continuing to work with my dealer but to no avail! This is a calculated measure that Honda is playing so they won't be subjected to Federal regulations if they did a recall. By just doing a product update they retain control but unfortunately they don't have a fix! They're kicking the can down the road! Shame on you Honda! Someone is going to get hurt or worse but they decide they would rather gamble and pay less legal costs in litigation than the expensive recall costs. They are rolling dice with our lives! I filed complaints with the NHTSA and currently taking some lemon law recourse to return my CRV! This is my first and soon-to-be last Honda! Ridiculous! ...And they recalled over 400,000 CRVs & Civics in China! After hearing about the recall I checked the oil level and sure enough it was substantially above the orange marker on the dip stick. My dealer applied the software fix provided by Honda and I will check very soon whether the oil level issue is still present. Update from Mar 11, 2019: Oil level is still above normal and oil is quite dark at 2000 kms after oil change. Has anyone else seen this condition? Car is still slow to warm up and heat indicator seems to stick at half way and then move up to normal quite fast. 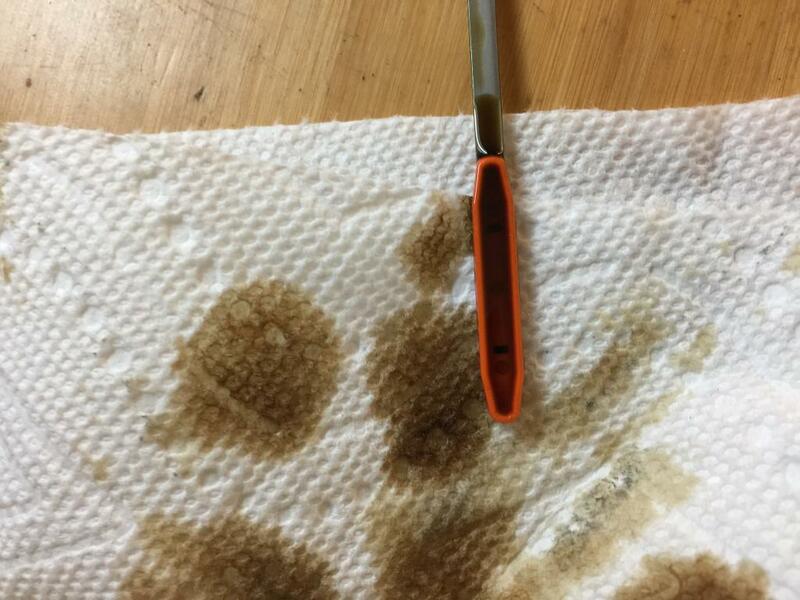 Engine oil level is more than a quarter inch above the orange bar and smells strong gasoline on it. Dipstick smells like gas. Take it to the dealer they change the oil and state that Honda has not given them a fix. Call Honda got a case number but no solution from them either. Problems from this issue of oil dilution will probably not show up until warranty is over. Honda needs to step up and get the fix out to us in Kansas (according to them not a cold weather state) too. This seems to be a widespread issue for the Honda CRV 1.5L Turbo (2017-2019) that Honda has not fixed. The dealership acts like this is normal for this engine but I don't think it's normal to have your engine oil level far above the max smelling of gasoline. They say it only effects engines in cold climates but I live in Phoenix, AZ. Yesterday i checked the oil level which was higher than normal and also it was smelling crazy gas. I do not have heating system issue since i never warm-up the engine in idle which is not a good practice at all. OK, i went to the Honda dealership today to replace the tires with Winter tires , and also the software update. Honda Canada sail they will change the ECU unit and air conditioning control unit and also they will change the oil. I think this is what they are doing; they will change the heating system control unit to let the engine warm-up very soon and then this will burn the vapor of the gas in a shorter time , this means that there is no fix for this issue at the of the way because they can never change the nature of the direct-injection engine. June 2017 bought new 2017 CR-V from Honda Dealer. Jan 2018 vehicle had 3970 miles so brought it to same dealer for 1st oil and filter change. No apparent issues. Nov 2018 vehicle had 8046 miles and Maintenance-minder indicated only 15% oil life remaining so I scheduled an oil & filter change at same dealer. Before the appointment I checked oil dipstick and it was way over the maximum mark (pictures attached) and smelled heavily of gasoline. Owners manual says never over-fill can cause engine damage. The only fill ever was done by the dealer at the1st oil change in Jan 2018. I related the gas smell of the dipstick to gas fumes my wife and I detected in the cabin at times. At that time I researched online and discovered there was an oil-dilution issue that was being investigated by Honda for this issue but no solution yet. I reported this situation to the service department when I brought in for the 2nd oil change but they couldn't offer a solution as well so took my info and said all we can do is wait for Honda to announce a solution. Meanwhile it is not known if there is engine damage occurring due to the overfull engine oil level and mix of gasoline in the engine oil. While looking for 2019 Honda CR-V colors, I stumbled upon a video on the 2017-2018 CR-Vs from a young man detailing the Oil Dilution issue causing the Oil Level to exceed the Maximum limit AND the definitive smell of gasoline in the Oil (via the Oil dipstick). I began to read where this was an issue with epidemic proportions. This "mixing" is causing premature Engine wear and worse for many drivers. My experience has been limited as the majority of my driving is mostly 80 mile drives in the Spring and Summer and I have not had any stalling issues yet. Upon the recommendation of the young man in the video, I checked my Oil which had been changed in Aug 2018 with only 500 miles and 80% Oil level showing to use. BINGO! The Oil absolutely smelled of gasoline and the level was above the Orange area of the dipstick I took my CR-V into my usual Dealership that does my service and the mechanic and service manager agreed that there was gasoline present in the oil and an Oil change was recommended and I was not charged. The manager indicated that Honda hasn't "officially" given them a SOP to deal with the issue until the fix is distributed to dealerships across the US. Latest information indicates that the "fix', which is to include to new software for the engine and transmission control units with an oil change, are being distributed in the most northern states (MN, WI, ND, SD & ME) in December. Other more northern states will follow in the following two months. I am fortunate in that our family has a second car and I won't need to drive the CR-V until the "fix" is available. CERTAINLY NOT great having to put your new car on "ice" while HONDA makes US wait! The oil smell is very strong. I have to change the oil very frequently. After I changed the oil, two days later, I notice that oil level become above the max limit mark and the oil become black very soon in less than 1000 miles. It seems there are also some debris inside. Honda should really fix this problem as soon as possible instead of try to ask the customer change driving behavior and change oil. This is my first car, overall I like its feature but it's very sad with such an annoying problem and disappointed about Honda since they did not come any way to fix it after discovering the problem for such a long time. Oil level was more than half a quart over capacity and smelled strongly of gas. Had oil changed at Honda dealer only 180 miles ago. Was told this was not unusual and not to worry. I think it is a serious problem and reported it to Honda of America and opened a case for further review. The dealer changed the oil and just told me to keep checking the oil level. Not very satisfactory to me. Update from Jan 19, 2019: After filling the gas and checking the oil after 241 miles since last dealer oil change the oil level on dipstick is creeping up again over high mark and is smelling of gas again. I have also noticed smell of gas inside cabin while excelerating. I bought my CRV in 2017. Only one week, my car stalled on the highway. I had to take it back to dealer. They did not want to pay tow fee. It's ridiculous. After they fixed my car, I asked what was wrong, they said nothing. One more month later, the gas mixes with the oil. It's terrible. Honda still tells me there is nothing wrong with it. Honda won't admit it's a problem. Oil sample submitted to Blackstone, 12/18, showed fuel concentration at 4.8% with a flashpoint of 290 degrees. I have contacted Honda dealership twice but no response. Oil has been changed twice on schedule at dealership, July and December. No problems with engine heating up or gasoline smell in cabin. 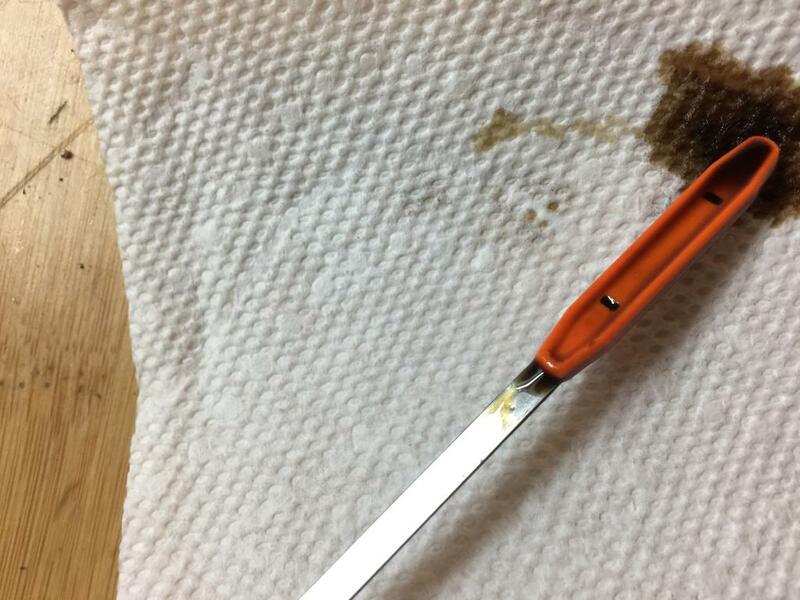 Gasoline odor detected by smelling dipstick with oil level elevated approximately 1/4 to 1/2 inch above full mark. Car is located in Virginia and not one of the states where Honda is providing a fix (reprogramming computer and changing out air conditioning control unit). SOLVED THE PROBLEM. 6000 MILES ON AN ENGINE AND DRIVING IT 6 MILES TO THE DEALER WITH A CRANKCASE FULL OF FUEL, IS LIKE PUTTING 60,000 MILES ON THE ENGINE. SO I TRADED IT FOR A 2018 RAV4. PROBLEM SOLVED.